Iowa Senator Joni Ernst is touting legislation to reform the system for providing former presidents with certain perks and benefits. “Taxpayers should not be on the hook for subsidizing former presidents’ lives to the tune of millions of dollars,” Ernst said in a conference call with Iowa reporters today. The perks for former presidents include office space, staff, and travel expenses. 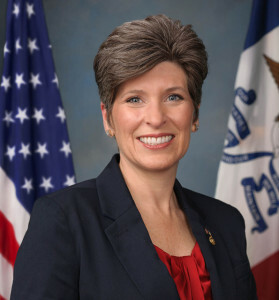 Ernst noted in fiscal year 2015, former U.S. presidents cost taxpayers more than $2.4 million in travel, office space, communications, personnel, and other expenses. A similar measure was approved by the U.S. House Oversight and Government Reform Committee on Wednesday. “At a time when we are more than $18 trillion in debt, it is critical that we stop talking and start cutting wasteful spending,” Ernst said. Congress approved benefits for former presidents in 1958. Ernst said there’s nothing in the proposed legislation that would cut the funding of the security or protection of a former president. According to a Congressional Research Service report last year, taxpayers spent over $420,000 on a more than 8,200-square-foot office in Dallas for George W. Bush. Former President Bill Clinton’s office in New York cost taxpayers $415,000.